NOTE: Julio Cesar Chavez Jr. did not make the contracted weight limit and the fighters have agreed to fight Saturday’s bout at the above official weights. 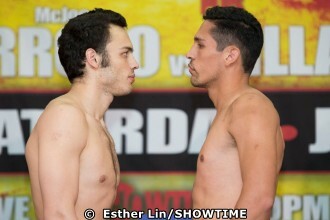 The evening event on SHOWTIME® features Mexican superstar Julio Cesar Chavez Jr. (48-2-1, 32 KOs) returning to the ring to face Marco Reyes (33-2, 24 KOs). In the co-main event, Puerto Rican Olympian McJoe Arroyo (16-0, 8 KOs) takes on Arthur Villanueva (27-0, 14 KOs) of the Philippines for the IBF Junior Bantamweight World Championship. Televised coverage begins at 10 p.m. ET/7 p.m. PT with undefeated 140-pound contender Amir "Young Master" Imam (17-0, 14 KOs) meeting former world title challenger Fernando "La Fiera" Angulo (29-9, 16 KOs) in a world title eliminator. The afternoon's PBC on CBS event is headlined by undefeated Irish superstar Carl Frampton (20-0, 14 KOs) taking on Alejandro "Cobrita" Gonzalez Jr. (25-1-2, 15 KOs). Televised coverage begins at 4 p.m. ET/1 p.m. PT with a heavyweight showdown between Chris "The Nightmare" Arreola (36-4, 31 KOs) and "Big" Fred Kassi, (18-3-0, 10 KOs).